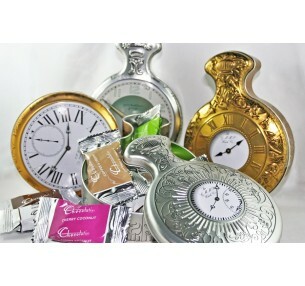 Give the vintage enthusiast in your life this wonderful retro clock radio gift tin and put a smile on their dial. The unique tin, containing peppermint creams, will hang around long after the contents have been enjoyed. Once empty it will make a useful container for coins, jewelry or even iPods and head phones! The detailed tin measuring W190mm x D95mm x H120mm, will make a popular gift anytime of the year: birthdays, Christmas, anniversary. Please specify which colour you prefer in the Comments Section at checkout: Blue or Pink.